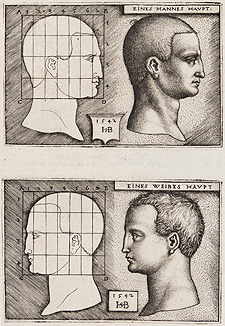 Hans Sebald Beham, Man’s Head and Woman’s Head, 1542, engravings from two plates on single sheet. Harvard Art Museums/Fogg Museum, Gray Collection of Engravings Fund, G8908. Prints and the Pursuit of Knowledge in Early Modern Europe examines how celebrated Northern Renaissance artists contributed to scientific inquiries of the 16th century. Rare and treasured prints, drawings, books, maps, and scientific instruments demonstrate that artists were not just illustrators in the service of scientists but that their work played an active role in facilitating the understanding of new concepts in astronomy, geography, natural history, and anatomy. Featuring work by Albrecht Dürer, Hans Holbein, Hendrick Goltzius, Jacques de Gheyn and others, the exhibition was organized by the Harvard Art Museums, Cambridge, Massachusetts, in collaboration with the Block Museum. An illustrated catalogue by Susan Dackerman, Carl A. Weyerhaeuser Curator of Prints, Division of European and American Art, Harvard Art Museums, accompanies the exhibition and is available for purchase at the Block's book and gift shop. The catalogue includes an essay by Claudia Swan, associate professor of art history at Northwesern University, and contributions from Northwestern art history graduate student Kathleen Tahk. RELATED PROGRAMS: Click here to find out about our Prints and the Pursuit of Knowledge Gallery Talks with curators and scholars and our weekly student-led discussions in the galleries. GUIDED TOURS: Block Museum docents lead free exhibition tours every Saturday and Sunday at 1 pm. Group tours can also be arranged in advance. Find out more here. AUDIO GUIDE FOR SMART PHONES: Curators and scholars provide additional insight about selected works in the exhibition through our audio guide. Text the word "block" to 56512 to have a link sent to your phone or visit https://bycell.mobi/blockmuseumppk. SELF-GUIDED FAMILY TOURS: Walk in the footsteps of an explorer! Discover navigational tools, maps, and more in our family tour kit, available for free checkout at the Museum book shop. Recommended for families with children ages 6 to 12. Watch more videos about this exhibition. ONLINE TOOL: Explore the exhibition through an interactive instrument available on the Harvard Art Museum's website. This exhibition and its accompanying catalogue are made possible by funding from the National Endowment for the Humanities, Mrs. Arthur K. Solomon, Lionel and Vivian Spiro, Walter and Virgilia Klein, Julian and Hope Edison, Novartis on behalf of Dr. Steven E. Hyman, the Samuel H. Kress Foundation, Barbara and the late Robert Wheaton, the Goldman Sachs Foundation, and an anonymous donor. Support for presentation of Prints and the Pursuit of Knowledge in Early Modern Europe at the Block Museum is provided by the Myers Foundations; Lyrica Endowment; Netherland-America Foundation; Samuel H. Kress Foundation; Alumnae of Northwestern University; Elizabeth F. Cheney Foundation; IFPDA Foundation; Robert Lehman Foundation; Alsdorf Endowment; Illinois Arts Council, a state agency; and the Evanston Arts Council. Photos: Department of Digital Imaging and Visual Resources, Harvard Art Museums, © 2011 President and Fellows of Harvard College.